It's Sometimes Legal to Park in a Red Zone in SF? Whaaaaaa?? 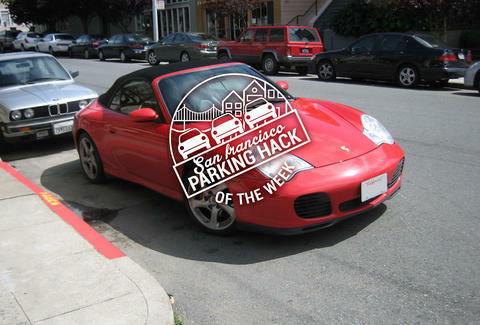 Editor's Note: Welcome to the SF Parking Hack of the Week, wherein we'll hook you up with one awesome, game-changing SF parking hack every Friday courtesy of the guy who wrote the book on them (no, like, really, he wrote a book about them). First (this is important): the part of the curb on either side of a driveway, or the “curb cut” as SFMTA calls it, is legally considered to be part of THE DRIVEWAY, not the curb. There were 29,272 citations issued last year for blocking a driveway. Many of these citations were given for having part of the bumper of the car jutting into the “curb cut” space. Logic leads us to believe that the curb cut is part of the curb, not part of the driveway, but illogically/legally, it is indeed part of the driveway. Also (this is important-er): you can't park in the red-painted area on the curb which extends the curb cut for another 3ft on either side of the driveway -- narrow driveway owners pay the city handsomely for this paint job to make it easier for them to get in and out. That said (this is important-est! ): if the red-painted curb does not have an official DPT, MTA, or SFMTA mark on it, it's not a legal red zone (haaaaack alert!). Only red zones painted by the city with a DPT, SFMTA, or MTA stencil are enforceable, meaning all those spots in the Marina that you just barely couldn't fit in because of the little bit of red after the curb cut? If it doesn't have the stencil on it, feel free to get all up in it. David LaBua is a leader in the sustainable urban mobility movement, author of Finding the Sweet Spot - The Insider's Guide to Parking in SF, and the founder of VoicePark. Have an SF parking question? Hit him up at sanfrancisco@thrillist.com.